Expanded user preference: operate on Ku or Ka-band. 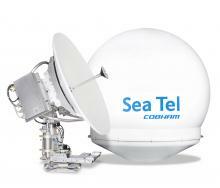 Frequency tuned radome for both Ku and Ka-band services. Simple and intuitive field upgrade to Ka-band (optional). Fully IP based “plug and play” architecture. Model 4012 GX will be the first antenna fully optimized to meet the demanding maritime communications needs of the 21st century. The 4012 GX architecture is being designed for ease of installation; extended web based secured user interface; built-in remote management capabilities; and integration into network management systems through its media exchange point (MXP). Model 4012 GX will have a highly integrated control unit (ICU). ICU offers a single box control instead of distributed antenna control architecture, replacing the Digital Antenna Controller (DAC) and Pedestal Control Unit (PCU). The Model 4012 GX is being designed to meet industry’s leading mechanical and safety requirements including IEC 60721 specification. The antenna system will have industry blazing stabilization accuracy, highly efficient antenna reflectors and frequency selective, fine-tuned radome design for peak performance in Ku and Ka-band.